Transactional Analysis has had a tremendous impact on my life. It’s changed the way I think about who I am and how I relate to others. Over the next few weeks I intend to explore this theory and how we can all use it to change our lives for the better. TA has grown a lot since Berne founded it but I am going to start off by looking at the roots of his theory. In later posts I will discuss each area further and will keep it simple here. 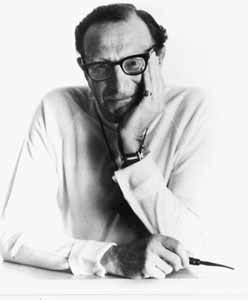 Berne’s original theory started with the core pillars of ego states, transactional analysis proper, strokes, time structuring and games, and script. If that sounds a bit complicated already then lets take them one by one. Berne stated that an ego state is a way of us experiencing the world. It’s a way of understanding how we relate to ourselves and others. There are three ego states, Parent, Adult and Child. When I write about an ego state I will capitalise the word, when talking about a real adult, child or parent I will use lower case. Our thinking, feeling and behaviour when we are in each ego state will be consistent. When we are in Parent ego state we think, feel and behave as our real parents or caregivers did when we were children. It’s like someone has pressed “play” on a recording and we play back what we saw without question. The Adult ego state deals with the here and now reality. It is the processing centre and important because it the only ego state that is not connected to the past. If I asked you how to make an omelette you would probably tell me from your Adult ego state. The Child ego state plays back thoughts, feelings and behaviours that we experienced as a child. From the excitement we feel at Christmas to the scare we have of being abandoned this ego state is rooted in the past. You can see straight off that out of the three ego states we could be in two of them are rooted in the past. This can spell trouble in our relationships and is one reason why much work in TA psychotherapy is done updating the Adult ego state with new information and challenging Child or Parent ideas that the client has that they mistakenly think are from their Adult ego state. This work is known as “decontamination of the Adult”. I also need to mention that the description of ego states above is pretty simplistic. There are now many different ways of thinking about the ego state model and in later posts I will explore some of these. A stroke is a “unit of recognition”. Berne said that we are all desperately seeking strokes from others and a lot of what we do is in order to be stroked. A stroke could be a nod of the head, a hand shake, a “hello” or a “get stuffed”. All of these acknowledge that the other person exists. There are different ways of getting strokes. Strokes can be positive (“hello”) or negative (“get stuffed”), conditional (“when you buy me presents I think you’re so kind”) or unconditional (“you’re stupid”). The only thing worse than a negative stroke is no stroke at all – we all have a desperate need to be seen by others. In a later blog post I will go into more detail about strokes and the stroke economy suggested by Claude Steiner because his ideas are very interesting and well worth understanding. 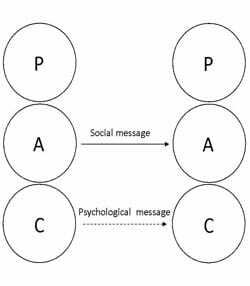 Transactional Analysis Proper – how we communicate. A transaction is an exchange of strokes. Berne came up with three ways in which we can do this and gave us some rules to help us understand what happens when we use each method. A complementary transaction is one in which person A says something from one ego state that invites a response from person B from a complementary ego state. For example, if person A says “I think you need to go and wash your dirty face” from a Parent ego state they are inviting person B to respond from their Child ego state and comply with something like “OK, I will go do it now”. Person B “Oh dear, come here and let me clean it up”. There are other combinations such as Child to Child and Parent to Parent etc but the important thing to understand is that whilst the transactions remain complimentary then the conversation can go on indefinitely. If you want to learn to small talk then it’s easy, just respond from the ego state the person you are talking to is inviting you to come from and you can chat forever! In a crossed transaction the response to the stimulus is from an ego state other than the one that has been invited. For example, when person A says “go wash your dirty face” person B responds with “don’t be so rude!”. 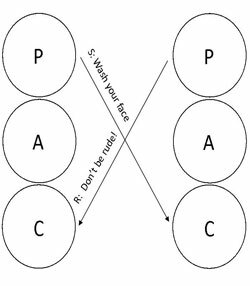 Here person A is inviting a Child ego state response and receives a Parent ego state response and is likely to be a bit confused as a result! Berne says that when transactions are crossed the the conversation stops until one or other of the parties changes ego state. This is a great way to pull a conversation to a close if you are not happy with the way that it is going – just be aware of the potential damage that it might do to the relationship between you and the person you are crossing. Berne says that we can communicate on two levels. There is the social message – what we say, and the psychological message – what we mean. Sometimes the two things do not match. Sarcasm is a great example of this. When we are sarcastic what we say is the opposite of what we mean. The person who we are being sarcastic to picks up the psychological message rather than the social message. When this happens the transaction is said to be ulterior. So why is it important to understand these three ways of communicating? In TA therapy the therapist will be interested in what ego state the client is coming from and where the therapist is invited to respond from, it’s one way of knowing what’s really going on between two people and with awareness often comes enlightenment and change. Positive change is the goal of psychotherapy. Withdrawal – We stay away from others, no risk but no strokes. Here, an example of a typical greeting (in the UK at least), we are not really interested in how the other person is, we are just saying “I see you” to each other. The risk of being rejected is very low as is the value of the strokes received. Activities – doing things can get us strokes and recognition. Transactions tend to be safe, usually Adult to Adult and so we can give and receive medium level strokes whilst not making ourselves too vulnerable. Pastiming – When we pastime we talk about safe subjects that both parties know the rules around. It’s the sort of conversations you might hear at a party or in the pub. The strokes value is increasing as is the risk of vulnerability. Sometimes pastiming my edge into the next level of time structuring – games. Games – are defined by Berne as “sets of ulterior transactions, repetitive in nature, with a well defined psychological payoff.” (Berne, 1971). An opening con (C), an invite from person A to person B into the game, has to hook person B’s gimmick (G). When B responds (R) the game is on. With B hooked person A can pull the switch (S) which sends person B into complete confusion or crossup (X). Once the crossup has happened then both parties can claim their payoff (P). Bob and Mary are a couple. Bob likes to play “Yes, But” and Mary’s favourite game is “I’m Only Trying To Help You”. Bob’s opening con is complaining that he hates his job (C). This hooks Mary’s need to make everything right for people (G) and she begins to suggest things that Bob could do to solve the problem (R). After a good while and several attempts with Bob turning down every suggestion Mary comes up with, Bob throws the switch (S) and tells Mary she is not helping at all. Mary feels confused (X) and claims her payoff (P) which for her is the familiar feeling that she is inadequate. Bob claims his payoff too, the familiar feeling of disappointment that no one can help him with his problems. Thus the game is complete and although both want intimacy neither have achieved it. Intimacy – this is an open and honest relationship that is game free. Both individuals give and receive freely without exploiting the other at any point. It’s what we all want and what feels most dangerous to us as we are at most risk of being hurt. 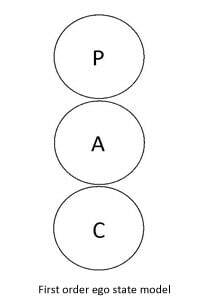 Script is a central part of Transactional analysis theory. Script can be seen as a well defined course of action that we decide on as a child. The theory states that we experience the world and make decisions about how we need to be in order to survive in it. We can carry on with decisions throughout our life even though we made them at an early age. An example of this might be the decision made by lots of boys early on in life that it’s not safe to cry and show emotions. This is reinforced by parental figures and other caregivers. As a result many men find it difficult to connect with their emotions as adults. A central belief of transactional analysis is that we made the decision in the first place so we have the power to change it. There is always hope that we can do things differently once our script is brought into awareness. 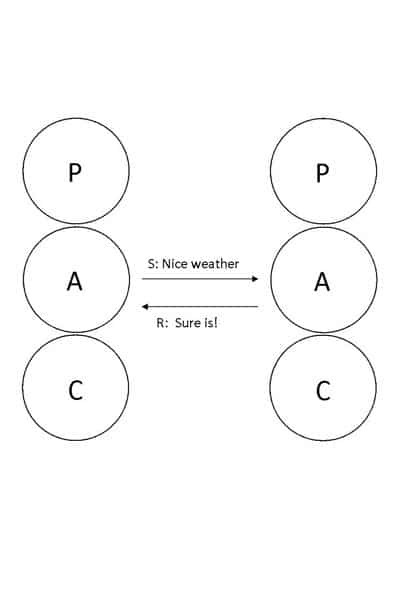 So there it is, the very basics of transactional analysis theory. Over the next few weeks I will be expanding these ideas further so subscribe to the RSS feed above if you don’t want to miss an installment. T A Today: A New Introduction to Transactional Analysis by Ian Stewart and Vann Joines is the standard “text book” of TA and is easy to understand. The quote in my article above is from Eric Berne’s What Do You Say After You Say Hello (1971). It’s mainly a book on script although Berne does introduce his TA theory at the start of the book. Berne is not an easy read, he tends to amble off all over the place so only attempt this book if you are a big TA fan. If you want to read more about games then read Berne’s Games People Play: The Psychology of Human Relationships. Again, not a simple read but flashes of genius are present in this book. Thanks Ali – keep reading for more super interesting TA information! An easily digestible description of Transactional Analysis,the ego states and communications used in everyday life. Thanks Gill, I appreciate your comment. I always aim to make my Transactional Analysis information understandable and I’m pleased I did this for you. Been attempting to research this for a while until I found your post. Thanks for the simplicity and clarity. I’m really pleased you find it simple and clear. If you want to learn more about TA just give me a shout! Ian Thanks for this, I am going to use it as a basis for my lesson this week ! You’re welcome Rory, give me a shout if you need any help delivering anything or you would like any training doing at your place! I’ve been studying TA since the books ‘Games People Play’, and ‘I’m OK, You’re OK’ were first published (and many others). I now wonder whether anyone has updated or increased the amount of ‘gains’, ‘advantages’, or ‘satisfactions’ quoted on page 18 of ‘GPP’? He gives four examples, namely, 1. The relief of tension. 2. The avoidance of noxious situations. 3. The procurement of stroking. 4. The maintenance of an established equilibrium. Have any more ‘gains’ been found since Eric Berne wrote that? This helped me and my group member a lot as we completed our research on the topic: Juxtaposing sales negotiations in a store as opposed to in the market: Ego States. Thank you Mr. Tomlinson! Amazing description of TA – very much appreciated! You’ve helped make a complex subject very easy to understand! This article was exactly the tonic I needed to help a friend of mind complete his M.Ed. degree. I knew nothing about TA before coming upon this article. It removed the dread and apprehension I was experiencing in trying to get to grips with a subject I was not familiar with. I thought I was completely out of my depth in helping my friend until I came across this artice. So a Big Thank You Ian for writing this. It’s a wonderful introduction to TA – easy to read and understand! You’re very welcome Henry, thanks for leaving such a lovely comment! Thanks for the comment Jaidev, pleased it was of use.